Marchand Petit is delighted to announce their appointment on The Millpool the long-awaited new development by Blue Cedar Homes in Stoke Gabriel. The Millpool as its name suggests is situated on the banks of the River Dart and comprises of only 10 luxury homes specially designed for the over 55’s. The development offers not only its unique location and views but has a mix of 3/4 bedroom houses and apartments with a stunning 3-bedroom Penthouse. 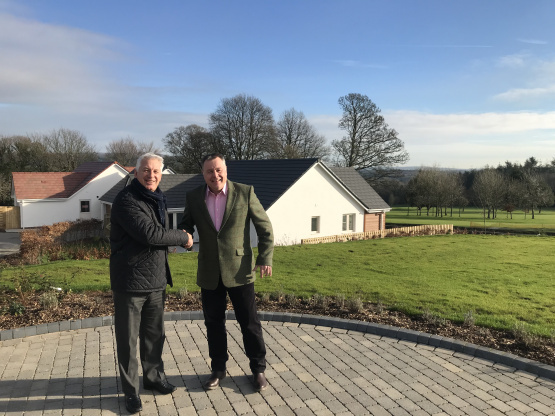 Blue Cedar Homes who specialise in creating developments for the over 55’s market is delivering exciting places to live following on from the success at Fairway Gardens in Sparkwell with Marchand Petit they took the decision to instruct them for their new scheme The Millpool in Stoke Gabriel. I was delighted to be instructed by Blue Cedar Homes on The Millpool and was excited about the range of properties that are available but was particularly interested in seeing the views from the amazing 3-bedroom penthouse. He further stated that a launch is expected in February when pricing will be released and reservations will be available off plan, but beforehand details on the properties available can be obtained from the Marchand Petit Totnes office. To hear about the launch please contact the Totnes office by calling 01803 847979 or via email on Totnes@marchandpetit.co.uk. Pictured Andrew Biggs Land and New Homes Manager, Marchand Petit and Chris Fayers Sales Director, Blue Cedar Homes at their development in Sparkwell, Fairway Gardens where a few properties remain available details can be obtained from the Newton Ferrers office of Marchand Petit on 01752 873311 or via email Newtonferrers@marchandpetit.co.uk.